CINCINNATI--(BUSINESS WIRE)--Former Google designer Jake Knapp, creator of the Design Sprint, released a second book Make Time, with co-author John Zeratsky, about creating time and finding focus in daily life. In the book, published by Penguin Randomhouse, Knapp, a long-time fan of Time Timer, recommends it as a tool for making every moment count. To complement the new book, Time Timer is offering a limited-edition Make Time version of the award-winning PLUS ® 120-minute timer, now available at timetimer.com and on Amazon. 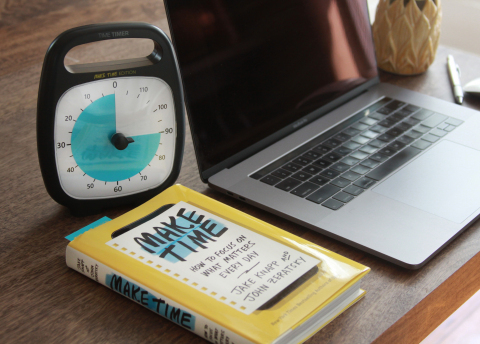 Make Time demonstrates how both authors, self-described “time dorks,” create time for what matters most, with methods and ideas that encourage readers to rethink the defaults of constant busyness and distraction. The special Make Time PLUS edition encourages direct application of the book, including a notepad to put the principles into action right away. "The Time Timer PLUS Make Time edition is perfect for the work day because it encourages me to think about what's most important today, then find a time to focus on it for 60-90 minutes,” explained Knapp. “The timer reminds me to pay attention to what matters, and when that happens, it's often the highlight of my day." Knapp, who also wrote the best-selling book Sprint, spent 10 years at Google and Google ventures and used the Time Timer in the creation of the Design Sprint, a focused and time-constrained innovation framework. He expanded his use of Time Timers to all aspects of his life, which is evident in the new book. “Make Time highlights the principle that defines our mission at Time Timer, which is to help people find ways to make every moment count,” explained Dave Rogers, president. The Time Timer was also highlighted in Sprint, including a profile of its inventor, Jan Rogers. Time Timer released a special-edition MOD timer to complement that book as well. Both special-edition timers are available at timetimer.com, on Amazon and at other national retailers. Time Timer releases new special-edition, 120-minute PLUS timer to complement Make Time, a new book from Penguin Randomhouse co-authored by Jake Knapp and John Zeratsky.